One last hurrah before the temperatures start dropping! 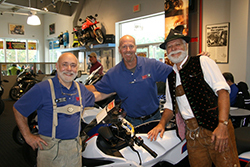 Meet Up at Bob’s BMW Fall Open House Oktoberfest celebration featuring a Motorcycle Swap Meet. Gather all of apparel, parts, and accessories you didn’t use this season and make yourself a little money! It’s free to set up and there is no commission collected from Bob’s! Contact hanna@bobsbmw.com for more details. Our good friends from Wolo Gourmet Food Truck will be onsite with food and beverages. Speak with VENDORS, win DOOR PRIZES, and shop our END OF YEAR CLEARANCE on Motorcycles, Apparel, and Parts & Accessories.